If your sewing machine isn't working like it used to, it may need a good cleaning. Many times, if something on your machine isn't working, it may need a professional cleaning and oiling. Maryanne is trained and certified to do the cleaning and oiling. She can take care of your precious machine regardless of the brand. Maryanne suggests getting your machine in for a cleaning once every six months with regular use. Having your machine professionally cleaned is important because trained professionals can get into areas that a home quilter cannot reach. Please remember to bring a bobbin, power cord and foot pedal that fits your sewing machine when dropping it off for service. Please read our sewing machine service/repair policy at the bottom of the Services Page. On the sad occasion that your machine can't be fixed by a good cleaning and oiling, Maryanne will also do repairs. 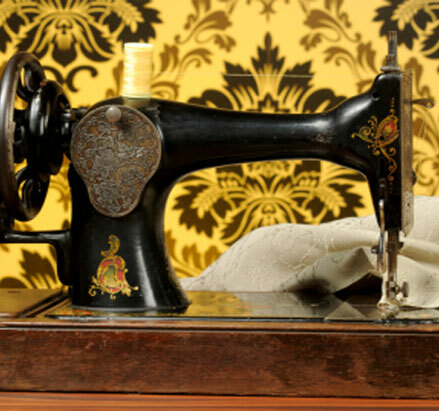 Please remember to bring in a bobbin, foot pedal and power cord that fits your sewing machine. Please read our sewing machine/repair policy at the end of the Services Page. If you are curious to know about how to clean your machine, Maryanne does lessons on how to care for your machine in between professional cleanings. The class is $10 and by appointment. Stop by the shop for more information or to sign up. An $10.00 Deposit is required for all sewing machine services & repairs. It will be credited to your bill when you pick up your sewing machine. If the sewing machine is not repairable and you pick up your sewing machine, your deposit will be refunded. If you do not pick up your deceased sewing machine, your deposit will not be refunded. It will goes towards the disposal of the sewing machine. Sewing machines must be picked up within five (5) business days after your sewing machine is serviced/repaired. Unless other arrangements are made when you drop off your sewing machine. And machines left longer that five (5) business days will be subjected to a $5.00 per day storage fee. Please be sure you have a bobbin, power cord and foot pedal when you bring in your sewing machine for service/repair. There are hundreds of different kinds of bobbins out there, we may not have a bobbin that fits your sewing machine. If you don't bring the above, you will have to make a second trip to the Shop. At this time, we do not service sergers. If you stop in or call, I will give you a recommendation to where you can take your serger to be serviced.